I haven’t done a dessert/sweet breakfast for a while and I think it is about time. I wanted to do something without nuts (coconut not included). I have nothing against nuts of course but it is really easy to go over board with them. Most desserts I make are nut based as are my muffins. I made a chocolate almond muffin (not my recipe) a while back and just for curiosity sake I put the data into Nutrition Data. I have to admit I was stunned with what I learned. One small muffin was nearly 300 calories. Man, I hope that thing is wrong. No, I don’t count calories nor do I even pay much attention to it but….holy crap that is a lot of calories for a SMALL muffin. The other little detail about nuts that I try to be aware of is their omega 6 content. It’s pretty easy to upset your Omega 6 : Omega 3 balance with nuts. So anyway, last night I was craving something sweet – no doubt because I had had a smoothie earlier in the day. (Anyone else like that? If you have something sweet or higher in carbs than you are used to, then the cravings for other carby things kicks into overdrive?) I went to my fridge and pulled out organic apples I had bought but turned out all mealy and soft (the kind that you have no choice but to cook them) and the remaining fresh organic blueberries (although I also made this with frozen and it worked out equally as good). This is what I came up with. I don’t really know what to call it other than a smashing success. The kids loved it and literally licked their bowls clean. Hubby gave it a thumbs up and helped himself to a second bowl. We ate it right out of the bowl by itself but this morning the leftovers were used to top waffles. Oh My! It was incredible. It’s a nice change from the usual bacon and eggs. As an added bonus to it’s flavor is the fact that it is lower carb and has no refined sugars so I had one waffle with some of this sauce and didn’t feel hungry for hours and hours. Had this been the sugary, gluten version I personally would have felt like crap right after and then felt hungry in less than 2 hours. It also did not leave me craving carbs all day. This topping would also be great on a minimally sweetened, dense, coconut pound cake. I am not sure if this will qualify for GAPS legal because of the baking soda in the waffles and the iffy stevia but it is absolutely 100% paleo goodness. Heat saute pan, add virgin coconut oil. Add apples and salt. Saute for 5- 10 minutes until they begin to soften. Add cinnamon, cloves, blueberries, coconut milk. Continue cooking until apples are soft and sauce has thickened a bit. When apples are soft remove from heat and add stevia and fresh lemon juice. Stir to combine. Serve hot in a bowl alone or serve on waffles or pancakes. Top with coconut flakes for garnish. 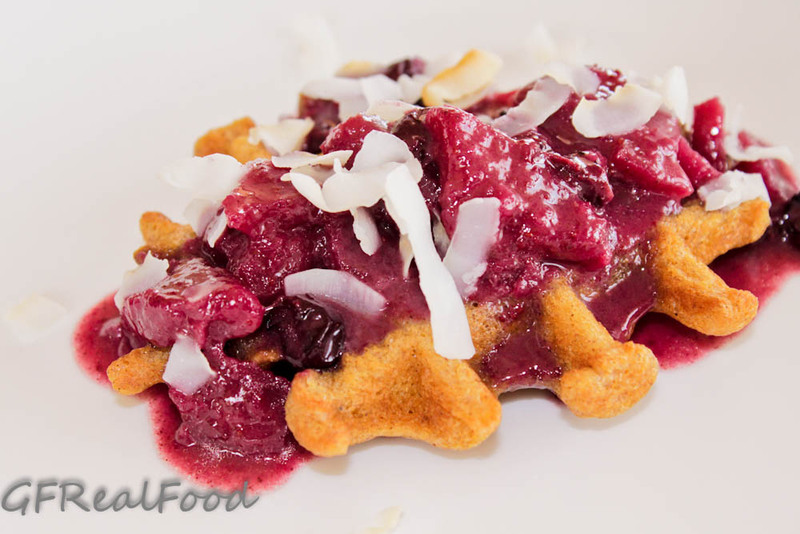 This waffle recipe was originally from The Food Lovers Primal Palate. I made it as they wrote it first then made some changes that suited our tastes. Here is what worked for us. For about half of the recipe I made these as pancakes the other half as waffles. It makes about 8 small waffles if you are only making waffles. Combine all ingredients and mix well with electric mixer. Tough hey? I used a couple of tablespoons of the batter onto each of the four sections of my waffle maker so that the waffles were small. They are done when the waffle is lightly brown and separates from the waffle maker easily. (Or when the light comes on and the steam subsides.) Top waffles/pancakes with Apple Blueberry sauce. Okay, these look absolutely delicious! I have a question, mine were very dry but the taste was good and the apple topping was very good (I didn’t use blueberries because I was out). Do you have any ideas or suggestions on making these a bit more moist? We too find that most coconut waffles/pancakes tend to be drier. I don’t mind as the topping adds so much moisture and flavor. You could try removing half of the coconut flour and adding almond flour in its place. I don’t have concrete amounts for you so you will have to play with the amounts to get the right consistency. I have also experimented with adding more coconut oil which I liked too. It made them more crispy as well as less dry. Other thoughts would be adding some full fat coconut milk. I love coconut! and I can not wait to make this!.